This week I take a look at both when and how to do a cereal mash when brewing beer. A cereal mash step is used with unmalted or low enzyme grains such as rice, corn or oats to gelatinize the sugars before continuing with a traditional mash. When to Use a Cereal Mash Step? A cereal mash step is not needed for most beers. If you follow the BeerSmith blog regularly you know that I usually recommend a single step infusion mash for all grain beer brewing. 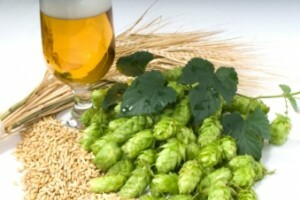 Beers made with malted barley or malted adjuncts (like malted wheat) contain plenty of enzymes. The sugars produced during the malting process (when the grain is malted by the manufacturer) are easily converted by a single step infusion mash by holding the grain/water mixture between 148-156F (64-66 C) for 30-60 minutes. So when do you need a cereal mash step? When brewing with whole rice, corn, raw oats, unmalted barley, unmalted wheat, rye or other unmalted grains, such as those often used for gluten free brewing. It is important to note that virtually all of these grains are also available in either a malted, flaked or torrified state often preferred by homebrewers. The malted, flaked or torrified versions have already been gelatinized (see below) so they don’t require a cereal mash step. Examples include all malted grains, malted barley, malted wheat, flaked barley, flaked wheat, torrified wheat, quick (Quaker) oats, flaked maize, flaked or puffed rice, flaked rye, etc. If you are using any of these malted, flaked or torrified grains you can skip the cereal mash entirely and just go to a single step infusion mash. What a Cereal Mash Does? Most raw grains (unmalted) store their starches in granules which are not released simply by soaking them in water even in a single infusion mash. However within a certain range, the starch will “gelatinize” and lose much of its structure, allowing mash enzymes to later access these starches. This temperature range is called simply the “gelation” or “gelatinization” range. It varies slightly from plant to plant, but for most grains used in home brewing it falls within the range 120-140F (50-60 C). Flaking a grain or torrifying it (popping it) also gelatinizes the grain by breaking down its cellular structure through heat and pressure. So raw grains that have not already been malted, flaked or torrified require a cereal mash step to gelatinize the starches before they can be broken down in the conversion step. Therefore a cereal mash uses at least two phases – one for “gelatinizing” the unmalted grains (called the cereal mash) and one for conversion of the sugars (i.e. the regular mash). How to Perform a Cereal Mash? Mill or grind your cereal adjuncts down into a fine grist – ideally smaller than your milled barley grains. Add about 20% of your total malted barley grains (i.e. Pale or Pilsner malt) to the cereal adjuncts. This malted barley will provide the enzymes needed to aid in converting and breaking down the sugars, as many cereal adjuncts don’t have sufficient enzymes by themselves. Next add hot water at the rate of 2-3 quarts/lb (4-6 l/kg) to produce a fairly thin mash. This is a simple infusion, but you want to target the gelatinizing temperature ranges listed above depending on your adjunct. So if you are working with raw oats, for example, you need to be in the 127-138 F (53-59 C) range. Hold the gelatinization temperature ranfe for 20 minutes. Slowly raise the temperature of the cereal mash up to a gentle boil and hold it for 20-30 minutes. As you do this the mash will go from a grainy mixture to a pretty sloppy gelatin mess that should coat the back of your spoon. When you reach the liquid goo phase, the cereal mash is good to go! Finally add the gooey mixture into your main mash. If you are working directly with the hot liquid, you can often use a decoction calculator to figure out how high your starting mash temperature needs to be when adding the boiling cereal mash to hit your desired sugar conversion range – which is usually between 148-156 F (64-66 C). The other option is to use cold water to bring your cereal mash down to the target temperature before adding it to the main mash. After that you continue your conversion phase and sparge as you would with any regular all grain mash. Why Bother with a Cereal Mash? Quite honestly I don’t do cereal mashes any more. The reason is that the flaked and torrified options are just as good and require only a single infusion step (no cereal mash). So if I want to make a Belgian Wit with 40% unmalted wheat, I will simply use flaked wheat and no cereal mash. If I want to make an Oatmeal stout, I use quick Quaker oats (instant oats) which are already gelatinized. If I want to make a Irish stout with unmalted barley, I just buy the flaked barley and do a single infusion mash. There is no advantage to the cereal mash unless you a truly working with unusual unmalted ingredients or just feel like playing around with raw grains you grew in your garden! Thanks for joining me on the BeerSmith home brewing blog. Be sure to join my newsletter and I’ll send you a home brewing article every week and check out the BeerSmith podcast on iTunes. Just a quick typo correction: 156degF is 68.9degC, not 66. Is there a resource for finding the gelitization temperatures of more uncommon grains and starches such as quinoa or beets or potatoes, etc.? After 28 years of all grain brewing, I’m playing with brewing an extra light ale, using 12% Broken Jasmine Rice, two row, and 6% cara pils. Will use Mosaic hops at 35 min for flavor, and again at last 6 min for finishing. Will bitter with Milliniums. . Thanks for your info on using separate mashing so to pre gelatinized rice with some malted 2 row, prior top blending back with main mash. Hi! I make gluten free brews. I recently tried to make a GF hefeweizen.. wheat is a no-no, so my random googling led me to believe that I wanted to use whole kernel corn or corn bran. Corn bran is not easy to find, and fresh whole corn is, so I used that. The beer I brewed is now in primary, and from the smell of the airlock I think it’ll have the flavor I’m looking for. So here is the problem. I had to make a guess as to what the conversion would be, between 1 lb. of malt and 1 lb. of fresh pulverized corn. I took a common recipe that used 70% pale and 30% adjuncts, and ended me up at around 1.055 OG. I swapped out the adjuncts for fresh corn, knowing that there was more water weight, and expecting to have a lower O.G, maybe more in the 1.045 range, which I figured would be fine for the Hefe. Sadly, the O.G. came out much, much lower, as though I used only the pale malt. I used a process that I know works with the same pale malt and similarly non-diastatic adjuncts. I still made it work, by boiling it down to a good O.G., but the mystery remains. So assuming I have enough enzymes in play, how much fresh corn to match, say, 1 lb. unmalted wheat as fra as starches? The article 5 ways to improve your all grain beer efficiency (http://beersmith.com/blog/2008/07/04/5-ways-to-improve-your-all-grain-beer-efficiency/) is showing and empty page. Why does the cereal mash need to be boiled? If the starches, let’s say corn for this discussion, gelatinize after 30 minutes at 155F, couldn’t you then just add that to the main mash? Why boil? THE MASH CRUSADER May 25, 2015 at 4:22 pm. So assuming I have enough enzymes in play, how much fresh corn to match, say, 1 lb. unmalted wheat as far as starches? The reason you hardly had any increase in OG from the corn is probably because you had little or no extraction from the raw corn. Your posting did not say anything about cereal mashing, thus I will assume that you did not do a cereal mashing. Thus your corn was probably not gelatinized, as your mashing temperature was probably way below the gelatinization temperature of corn. Next time, you will have to cook the corn first, by way of cereal mashing, before adding it to your mash. That’s the only way to get contribution to the OG from the corn. Otherwise you’ll be riding on the OG contribution from the malt only.